Did you know Manchester is home to the nation’s first free public library? Or how about the fact that it’s where the vegetarian diet hails from? There’s a lot to be discovered in Manchester. Whether you’re a foodie fanatic or culture buff, this vibrant city is made up of an array of quirky cafés, eclectic nightlife spots and jaw-dropping architecture. If your holiday isn’t complete without a spot of shopping, a visit to Manchester will definitely not disappoint. The city is home to a number of shopping centres, high-street favourites and unique boutiques. Travel tip: If you’re looking for one-of-a-kind boutiques and quirky finds, be sure to check out The Northern Quarter. You’ll find everything from vintage stores to old-school record shops! Foodies, if you fancy eating your way around the city, you’ll have a long list to get through! Tuck into a traditional Lancashire Hot Pot, grab a fresh bite to eat from the food markets, or dine in a rose garden at Tattu… the foodie scene in this part of Britain is as diverse as it gets! Mackie Mayor: a unique foodie concept that’s set in an 18th Century market hall with a glass roof. Where the Light Gets In: a buzzing restaurant that looks just like a Victorian coffee warehouse. The Refuge by Volta: dine under a canopy of greenery in a stunning Winter Garden. If there’s one thing Manchester is famous for, it’s football. If you’re planning a visit, be sure to buy tickets to one of the footy matches – trust us, the atmosphere will be something like you’ve never experienced before! If you’re really keen, you can even pay a visit to the National Football Museum where you’ll find a massive collection of over 140,000 items. Travel tip: Book yourself a stadium tour at either Manchester City or Manchester United. You’ll get to walk down the players’ tunnel and even sit in your favourite players’ chair! As well as football, Manchester’s cricket scene is also super popular. In fact, the ICC Cricket World Cup will be coming back to Emirates Old Trafford this year for the first time in 20 years. Cricket season will kick off on 16 June 2019, so if you happen to be in Manchester around this time, be sure to get your hands on tickets. Travel tip: Fuse cricket with party vibes at Emirates Old Trafford’s Foster’s Fan Village, where you’ll find everything from live music to awesome entertainment. Whether you’re interested in natural history, science or art, Manchester is home to a fascinating collection of museums and galleries. The best part? Most of them are free! Travel tip: Check out the Manchester Museum – it’s the city’s largest institution with enough exhibits for an entire day of exploring. The Ancient Egypt and Archaeology exhibitions are a must-see! A trip to Britain isn’t complete without a memorable night out, and the nightlife scene in Manchester is no exception. From trendy clubs to laid-back live music nights, the city offers a diverse line-up of nightlife events that will impress. Travel tip: Add Gorilla to your itinerary – it’s a hip nightlife venue that’s located under actual railway tracks. From luxurious Airbnbs to Victorian-style hotels, there are plenty of spots to choose from when it comes to accommodation. Most places are located in the city centre so getting around is pretty straight forward. Travel tip: If you’re looking for both culture and luxury, The Principal is one for the books. This hotel has been around since the 1890s, when it first opened as the headquarters for The Refuge Assurance Company. Now it has become one of the most popular hotels in Manchester! Bringing a traditional taste of Manchester to Dubai, Rhodes W1 will be celebrating the ‘Magic of Manchester’ every Tuesday night until the end of March. Expect Mancunian music along with a Mancunian inspired three-course dinner menu for AED 195 per person. Ready to #RediscoverManchester? 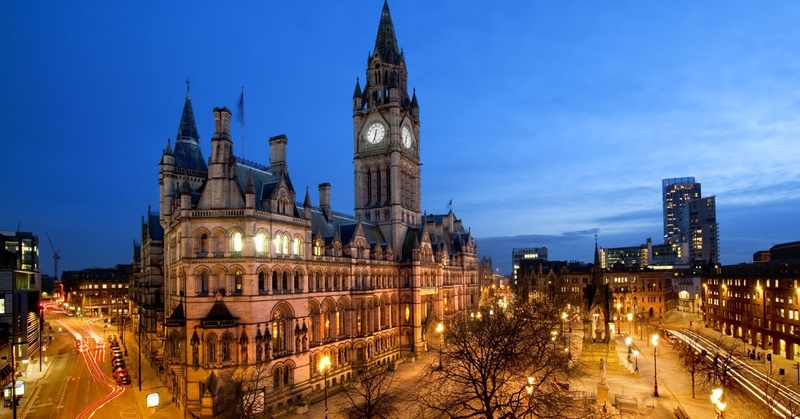 Check out ‘Visit Manchester‘ for all the city inspo you need!